Like their smaller brethren these Classic speakers produce a scale, presence and involvement out of all proportion to their size – and price. In short, they are truly astonishing and re-write listeners’ expectations of music reproduction in the home. Breath-taking is one description. “Smitten” is the word Paul Messenger used in his review HiFi+ Classic. Read also Positive Feedback and especially SoundStage Ultra for greater understanding of the Classic’s capabilities and the extraordinary manufacturing demands. 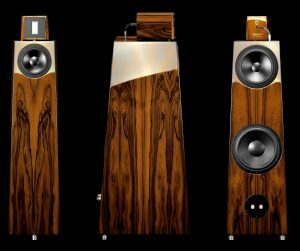 Every time, listeners and reviewers comment on the huge scale and power of the Classic, performance well beyond its actual size compared with physically ‘big’ loudspeakers. Soundstage is massive and immersive, while bass is deep, clean and fast, providing the essential underpinning for large-scale performances, whether classical, electronic or rock. The Classic is ideal for larger listening rooms but versions can be fine-tuned for smaller rooms to suit customer tastes and circumstances. 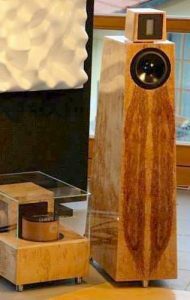 These extraordinary loudspeakers were the first in the range, and over the years in many countries have regularly earned ‘best sound at the show’ comments from experienced reviewers. Rainer Weber, the designer, is both a committed audiophile and also one of the world’s leading acoustics and psycho-acoustics experts, retained by the German automotive industry to design solutions for Mercedes Benz, BMW and VW/Audi vehicles, designing out intrusive noise but feeding back the essential sounds that give us aural confirmation of an action. The Classic has many unusual features, one of which is that they can be fine-tuned to individual tastes and room conditions. 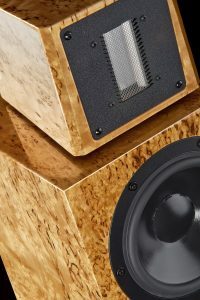 There’s a choice of three custom bass drive units, so depending on the reverberation time of the listening room and listening preferences Kaiser will select a matching woofer, tune the port frequencies and the midrange passive drive unit on the back to optimise the sound. From the partnership with Vertex AQ in the UK a key performance option is an upgraded internal crossover with Vertex’s vibration-draining labyrinths and EMI/RFI shielding. Taken a stage further this crossover can be housed externally, away from the cabinet’s internal energy, and built with the best Duelund capacitors and coils. Over many years hundreds of customers have enjoyed truly massive improvements to system performance from Vertex components, especially around the speaker/amplifier interface where signal damage from speaker-generated vibration can hobble even the most exotic systems.